Manchester City were in cruise control against a 10-man Wolves as they strolled to a 3-0 victory at the Etihad. Pep Guardiola made two changes from the massive win over Liverpool as Kyle Walker and Gabriel Jesus came into the fold for Vincent Kompany and Sergio Aguero. Jesus took center stage with a well-taken brace after Willy Boly was given marching orders in the 19th minute after a mindless challenge on Bernardo Silva. While the tackle in itself was not particularly reckless, it is Boly’s rash follow-through onto Silva’s ankle that rendered the foul irreprehensible. Conor Coady’s 78th minute own-goal made matters worse for the visitors as a probing cross from Kevin De Bruyne struck the Englishman’s leg to confirm the inevitable. 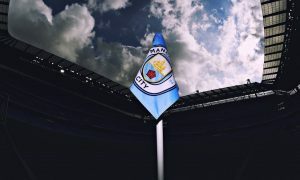 City have clawed back Liverpool’s brief 7-point lead with the victory over Nuno Espirito Santo’s side and continue to be hot on the heels of the table toppers. The Brazilian shot-stopper could not have an easier evening if he asked for it. With the visitors failing to record even a single shot on target, Ederson was untested and was neat with his distribution throughout the contest. However, the ex-Benfica man had a moment of madness in the 85th minute when he assumed sweeper-keeper duties and lost the ball for a brief moment. No damage was done and Ederson claimed his first cleansheet since October against Burnley. After a brief spell of horror shows at the back from Walker, he repaid Guardiola’s faith with a solid showing. The English defender’s positioning and strength were top drawer and he was very neat on the ball. It was a field day for the City backline after Boly’s sending off, however, Stones rose to the minimal challenges that he was faced with during the clash. His passing was faultless and at this point, it has become standard procedure for the 24-year old. The Frenchman’s defence-splitting pass to leave Ryan Bennett and Matt Doherty rooted to their spots and set up Leroy Sane, who had the simple task of putting the ball into the path for Gabriel Jesus’ opener was nothing short of sublime. Laporte has a tendency to find Sané with a looping ball over the lop, butthe weight of pass and direction executed by the centre-half would be applauded by even the likes of David Silva and Kevin De Bruyne. However, the former Athletic Bilbao man struggled against the brute strength and pace of Adama Traore in the second 45. Deployed at left-back, Danilo showcased his versatility and commitment to the cause, however, the Brazilian’s lack of guile, both on the ball and in terms of decision-making was evident. Due to the fact that he is not as technically proficient as his compatriots, full-back, in particular is a position he will struggle to nail down in a Guardiola system. After a superhuman performance against Liverpool, Fernandinho was his usual brilliant self this evening. Nicking the ball off opponents while playing immaculate passes from just outside the box, the visitors had no answers to cut off the Brazilian’s supply. Apart from a yellow-card in the 13th minute, this was yet another impressive performance from the evergreen midfielder. The Spaniard made history by becoming the holder of the all-time leading Premier League appearances in the club’s history with 267 outings. His display could not live up to the billing as Silva was showing signs of menace in the channels, however his final ball was lacking tonight. The veteran midfielder did exchange in a brilliant piece of play with Raheem Sterling that was key in winning the winger a penalty. He was substituted in the 61st minute for De Bruyne. He simply went about his duties and did not really have any awe-inspiring moments. Especially in an attacking sense, the Ligue 1 winner was not at his wily best. The Englishman had a quiet first half, however, he drastically improved in the second. He won the crucial penalty that was converted by Jesus to put the game to bed. While he was not at slick as usually is, Sterling was certainly causing problems and was a constant headache for the Wolves back three. If the tail end of 2018 was tumultuous for Jesus, 2019 has been just as successful as he has scored his 7th goal in a mere 3 starts. The former Palmeiras striker was well-positioned to score a simple tap-in and scored an ice-cool penalty to earn a brace. Not just his goals, but his general link-up play and positional interchange with Sterling and Sane was a joy to watch. The German was a constant nuisance for Bennett to curb as his culmination of speed and close control was simply too much to handle for the 28-year old. While Laporte’s masterful pass was the protagonist of City’s first goal, Sané’s darting run in behind and pinpoint cross was ideal. He could have had another assist after a series of dribbles and probing pass almost set Sterling up. It was a definite surprise seeing De Bruyne starting on the bench tonight, but that just proves that Guardiola wants to wrap his star midfielder in cotton wool as he has missed a majority of the season through injury. The Belgian’s crossing and through balls were deadly and the Wolves defence was constantly in sixes and sevens on how to handle his delivery. In the 78th minute, another one of his darting crosses struck Conor Coady and City were 3 goals to the good. De Bruyne could have had a goal after a ferocious strike was saved on the near post by Patricio. He looked extremely determined to make his mark and looks set to start matches again. He was a lively presence and was heavily involved in the build-up play. Aguero replaced Jesus and did not have enough time to cause damage.